The SC2000/470 & SC2500/470 Telescribe® Marking System provides permanent low-noise marking in a more compact footprint. The SC2000/2500’s robust X/Y stepper motor driven platform provides an ample 2.95” x 1.57” (75mm x 40mm) marking window, along with a wide selection of marking pins make it an excellent choice for many manual and automated marking applications, especially those with speed/depth requirements beyond those of traditional stepper motor-driven designs. Marker performance characteristics vary significantly depending on the specifics of the applications, including the material being marked, the thickness of the material and the air pressure setting. When marking cold rolled steel with a thickness of .030” (.75mm) or more, marking depths of at least 0.05mm (.002” inches) can be expected and when marking thinner, softer materials marking depths of up to 0.075mm (.003”) can frequently be achieved, even at marking speeds of up to 2 characters-persecond for 3mm (.125”) characters. 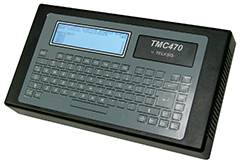 The system’s stand-alone TMC470 Controller is equipped with an integral keyboard and LCD display and provides a simple user friendly operator interface with no PC required. In addition, the TMC470’s discrete I/O, serial and Ethernet ports provide the communications capabilities required for factory automated applications. Compact scribe marker head that weighs only 6 kg (13.2lbs). Provides performance far beyond conventional step per motor-driven scribe markers. High speed marking of 3mm tall high quality characters at up to 2 characters-per-second. Marks at depths up to 0.05mm (.002”) in cold rolled steel. 2.95” x 1.57” (75mm x 40mm) marking window. Easily integrated into a wide range of automated online and manual applications.